Joseph M. Atkinson (Joseph Mayo), 1820-1891 God, the Giver of Victory and Peace. 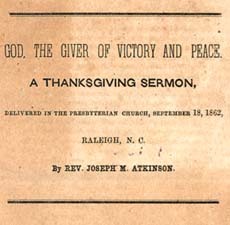 A Thanksgiving Sermon, Delivered in the Presbyterian Church, September 18, 1862, Raleigh, N.C.
God, the Giver of Victory and Peace. A Thanksgiving Sermon, Delivered in the Presbyterian Church, September 18, 1862, Raleigh, N.C.
North Carolina -- History -- Civil War, 1861-1865 -- Sermons. Peace -- Religious aspects -- Sermons. Sermons, American -- North Carolina -- Raleigh.